Chicago newcomers Relentless fit their moniker and the title of their opener Trapped Underground pretty well. The band is definitely far from mainstream radio friendly music, i.e. “underground” tag applies, and they work tirelessly throughout their debut EP Souls of Sharon. They are trapped too, somewhere between classic heavy metal and traditional doom, the style really made popular in Midwest by many bands from Indiana just south from where Relentless reside. Relentless can milk the main characteristic signature riff in their songs (Trapped Underground, Final Wishes) pretty well. In another example Better Off Dead squarely builds up on this foundation and can pass originally for a cool bar song, until bass lead elevates it, decelerating right into the lengthy jam, full of melodies with a totally different set of riffs. This is the beauty of many of the songs on Souls of Sharon. 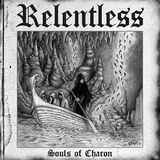 Unlike many others in doom genre, where songs can really stagnate, Relentless does not allow them to. From the mesmerizing lull to a friendly chug forward, Trapped Underground is a perfect example as to how the band approaches their song writing. Before you notice it there is a ton of melody woven into the perpetuating lead and you can’t help but nod your head in approval. Hypnotic chugs alternating with bluesy jams, and doing it from the heart, is only one of the ways the band keeps the interest constant (Final Wishes). Speaking of being emotive, as well as getting their own individual feature, the band is led by a female vocalist Carlee Jackson. Even when she sounds floating away and withdrawn, Carlee’s vocals are clean and strong. The spot to pass judgment on her voice is probably at the beginning of United by Darkness, when she is carrying the load all by herself. Pouring her heart out, she tries harmonizing to the slower towering epic riff of Forever Damned, something that could not leave listener unmoved, especially because there is a sense of Celtic/Irish longing in this song. And just like many of the songs before them, Forever Damned also ends up in a rambunctious jam. Carlee may be struggling a bit on the most classic metal title track on the EP against double bass background and heavy bottom end, but she is a very capable vocalist for Relentless. Not in the vein of more powerful screamers like Veronica Freeman from Benedictum or Nina Osegueda from A Sound of Thunder, Carlee has a bit of a mysterious frontwoman from The Devil’s Blood in her. Even though the production can be called do-it-yourself on Souls of Charon, the sound on the EP is very dense, and at the same time clear and voluminous. The musicianship is quality as well, but, most importantly, the whole package breathes talent and devotion, something I was immediately attracted to throughout the album 36 minutes. This one comes with the strong recommendation, if your definition of doom is not only never-ending slow gloom, and playing good old metal with involved guitars is something you like hearing in this day and age.